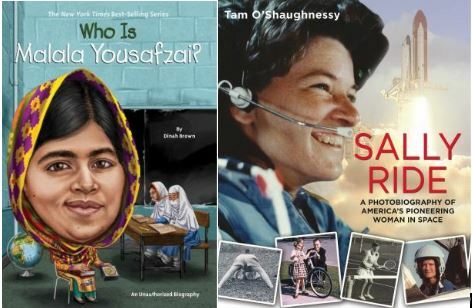 Today the Best of 2015 list continues with all things nonfiction for children and adults. Larger-than-life black and white drawings are paired with poetic texts that reveal the ways in which endangered creatures- – including lions, elephants, giraffes, tigers, gorillas, penguins, Ethiopian wolves, macaws, turtles, and zebras- – live on Earth. Unleash your imagination as you journey through the wide-ranging world of LEGO building. It is filled with bright visuals, step-by-step breakdowns of 40 models, and nearly 150 example models from the world’s best builders. A book with the latest discoveries, internet gems, urban legends, wacky myths, and tantalizing tidbits that are really true. This book is part of the wildly popular biography series Who Is?, and now there are What Was? books also! A biography of the famous astronaut drawing on personal and family photographs from her childhood, school days, college, life in the astronaut corps, and afterward. A collection of humorous essays on what it’s like to be unabashedly awkward in a world that regards introverts as hapless misfits, and Black as cool. Young and bright civil servant Anna is gradually becoming sensitive to light and finally has to retreat to a room of complete darkness. The fact that she has so much to offer and such interest in life makes her situation all the more difficult to accept. A history of office/school supplies! This is an impeccably researched and brilliantly written book about “two of the workingist boys” of turn of the century America. It’s a heartfelt letter to Coates’ son, depicting what it’s like to be black in America. He outlines the history of slavery and how the country is still experiencing a major racial divide. Ronson explores how social media and the Internet have brought about something of a public shaming renaissance, and he explores the history of public shaming to show how it has changed with technology. This entry was posted in Best of 2015, Children's Books, Nonfiction and tagged best of 2015, non-fiction by everettpubliclibrary. Bookmark the permalink.